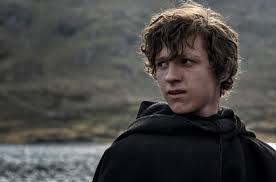 Probably the last place you expected to see Marvel-ites Tom Holland (Spider-Man: Homecoming) and Jon Bernthal (The Punisher) next was in a bleak, brooding Middle Ages drama like Pilgrimage. There aren't any super powers or colorful costumes here...in fact, there are hardly any colors at all except for dark red blood spilled by penitent holy men in protection of ancient relics they have put all of their faith into. 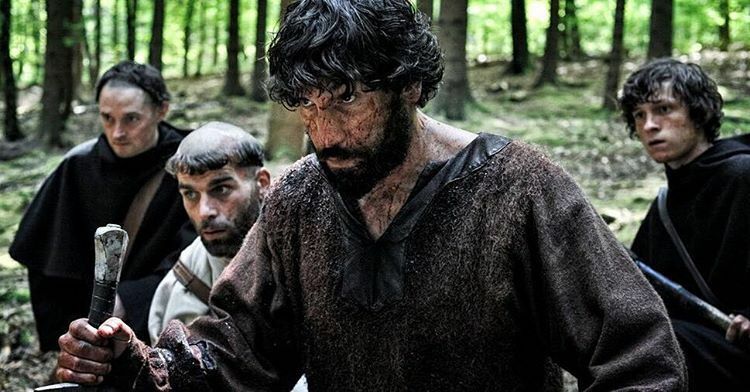 Pilgrimage is, at its core, a road trip movie where the road is muck and the only vehicles are the worn sandals of devoted monks. Pilgrimage is one of those movies, set in the 13th-century when relics and totems meant religious power. The Crusades are happening everywhere, and a small band of monks and young boys protect a supposedly powerful relic from the surrounding armies of the Vikings and Normans. They have sworn their lives to defending this object, but when the Cistercian (Stanley Weber) arrives with a papal decree to deliver the relic, these devout men must brave the treacherous road to do so, despite their misgivings. Good luck with that. Infidels surround them at every turn, and getting out of Ireland with the relic will require an act of God. Suddenly, their faith is just the tiniest bit shaken, and in creeps the paranoia of superstition, the curse of disloyalty. Sent along on this mission is The Novice (Holland), picked because he has seen nothing of the outside world. He is an innocent, and this journey will see him grow into a man through blood and tears. Alongside him is the mysterious, enigmatic man simply called The Mute (Bernthal), who might have the name of a supervillain but is made of sterner stuff. Or is he? That's really the mystery, isn't it? Clearly the man is hiding something. Because the relic itself is just one giant MacGuffin, there to test the monks' devotion as they brave haunted forests, warring tribes, and betrayal. Long-held cultural institutions battle against deeply-held religious convictions in writer Jamie Hannigan's lean script, brought to murky but efficient life by director Brendan Muldowney. For me, it was a breath of fresh air that Hannigan's screenplay focused more on the various relationships within the order than on the tenets of their faith. The relic can only be touched by one who is "pure of heart", but can any of their number claim to be so? 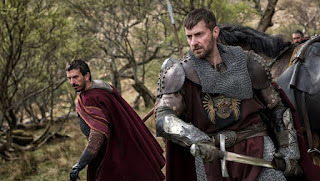 There are treacheries from within, and vengeful knights on the hunt (the main culprit played by The Hobbit's Richard Armitage), but nothing quite so dangerous as a lack of conviction on a quest to deliver hope. Speaking of which, Bernthal may not utter a word here but he has never been this intense, this bottled up with guilt and rage. The man is a presence. Holland gives another strong non-Marvel performance this year (the other was in The Lost City of Z), capturing The Novices innocence, earnestness, and evolving maturity. Despite the fan-favorite casting, Pilgrimage isn't the kind of movie that generally attracts large crowds. But those who check it out to see what else Bernthal and Holland are up to can have faith that their time will be rewarded.